Aquaponics is a fast growing hobby for many every day gardeners. Like me, taking hydroponics (soil-less vegetable growth) and adding a great protein source (fish-in our case tilapia). But there is a learning curve to getting everything right, for explosive plant and fish growth. After getting our systems set-up and growing for a few months, I found that my system was overloaded with fish. Tilapia are a very prolific breed, having 300-500 babies in one birth. We have harvested fish, but getting that many small fish to adulthood for dinner takes a lot of space, not to mention the amount of waste produced. I thought fish waste was good. It starts the bacterial process to feed the plants the much needed nitrates for strong growth. But as I found, too much fish waste can be extremely detrimental to both plant life and the fish. I started looking for an answer, beyond adding more tanks, just until I get the population under control. Enter the worm, red wiggler compost worms to be precise. These little workers love living in grow media and digesting all of the heavy solids from the fish. In return for a great habitat and plenty of food, they return worm castings or when added to the water of the system it is called “worm tea”. Worm tea has been a staple for many gardeners through the years. 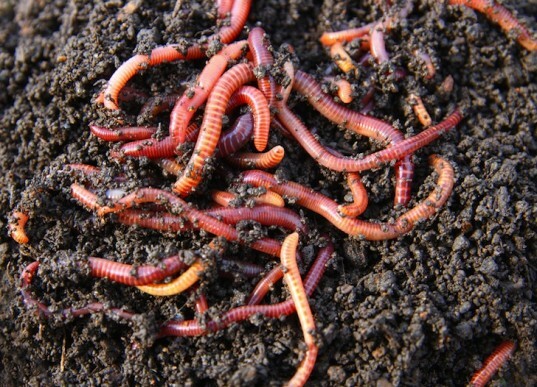 Vermicomposting, using worms to breakdown a compost pile, gives gardeners a potent fertilizer within the soil. This is nature’s perfect fertilizer. Adding a handful of red wigglers into the grow bed of the aquaponics system super-charges plant growth. It also has an added benefit of suppressing some vegetable plant diseases and the culmination of insect pests like aphids, tomato horn worms, and spider mites. So after adding fish to your system and starting your plants, add a handful of red wigglers to your grow bed. You will be amazed at the results. Intersted in Aquaponics? Our next Aquaponics Basic class is now forming. As I go down the path of Aquaponics and just gardening in general, one of the things I am going to do is start a worm compost. That project will likely start very soon. Once I have my worms I can certainly try this suggestion out! Thank you so much for this information! I’ve read a little about aquaponics but not made a commitment to start — definitely still in the information gathering stage. Thanks for stopping by. I started aquaponics a little reluctantly, but got hooked! Good luck on your adventure into it.